Before we can actually start reviewing anything decent, let's get whatever interesting filler there is for Cosmic Roar out the way first. We start with Cosmic Hero Grandsub. For a Generation Break 1 ability, whenever his power reaches 13k by any way other than boost or guard, the vanguard gets 4k and an on-hit skill to retire a RG when the vanguard's attack hits. Basically here to facilitate a chain to bring the 45k power threshold the G-Units require. A ruling states a trigger can spring Grandsub, so as damage checks go it works defensively too, but that's a bit situational, so assume you're using it to attack. It's nice to bring a bit more pressure on your vanguard but does little to solve a well-timed PG to the face. Cosmic Heroes play an information game so don't waste this guy. Looks like it's rare week. Every card this week is a rare, but each one gives new life to each deck-type, well, save for the new deck type, since it didn't have a decktype before. Anyway, Grandsub here is a mighty sea warrior that would be better suited in the Aqua Force rather than Dimension Police for his lore abilities. Gameplay wise, however, if, at GB1, you manage to increase his power to 13000, he pumps up your Vanguard by 4000 and gives it an on-hit retire skill. That's pretty nice. 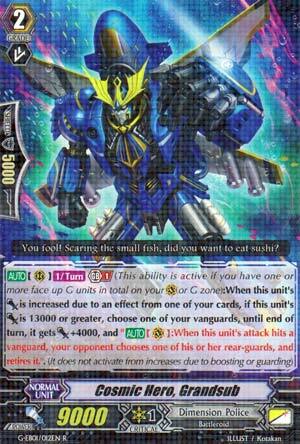 Obviously meant to be used with the rest of the GBT-01 support to give 4000 power boosts left and right. If you don't know, it's worded like Original Daiyusha, you have to have the power up to 13000 before you attack to get the skill. I... I can't tell, exactly, if you can use it off of triggers or not, so I can't comment one way or the other here. Basically, you have one of your rear guards that can give one unit a +4000 power boost give it to Grandsub, who then gives that same power to your Vanguard. It's a nice 2-for-1 that gives some combo puu-puu platter skills, but isn't as insane as a Break Ride was, thankfully. I'd say use it, simply because combo platter skills and power bonuses are always nice.